Metering System: Exclusive 3D Color Matrix Metering using a new 1,005-pixel RGB sensor to read a scene's color as well as brightness and contrast. Flexible Center-Weighted Meter enables sensing area size to be changed (with custom setting). Spot Metering changes the meter's sensing area to correspond to the manually selected focus area. Film Advance: Exclusive new powerful motors and CPU enable a high-speed film advance of up to 8 frames per second even with automatic Focus Tracking operation. Selectable automatic advance with the built-in motor drive, S (single-frame), CL (Continuous Low), CH (Continuous High) or CS (Continuous Silent) shooting mode. Autofocus: Nikon's exclusive new cross-ranged, five-area autofocus sensor (Multi-CAM 1300) system covers a wider area than any system before it in both the horizontal and vertical ranges in the viewfinder. Shooting Modes: Programmed Auto, Shutter priority Auto, Aperture Priority Auto and Manual. Flash: Shutter operates at 1/250 sec. 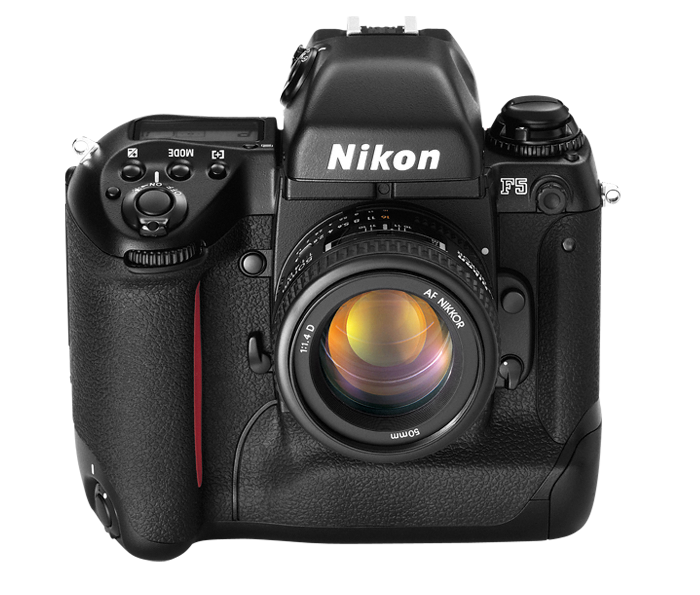 or slower speeds with Nikon Speedlight at X contact (transistor type). Type of Camera: Integral motor autofocus 35mm SLR (Single Lens Reflex) camera.